That which we frequently ponder and think about becomes the inclination of the mind. Many life situations that people would term “legal problems” involve some recognizable loss or threat of loss – loss of love, loss of identity, loss of comfort, loss of freedom, loss of physical well-being, etc. Whether this loss is real or more a future projection, these experiences often precipitate further thoughts of danger to one’s perceived stability or station in life. These thoughts then give rise to feelings of fear. This fear than triggers a range of biochemical changes, as well as behavioral byproducts such as defensiveness, aggression, withdrawal or other avoidance behavior involving certain amount of disconnect from reality. If we consider the above precept of Buddhist psychology, these extent to which we continue to entertain thoughts associated with loss will largely determine how “stuck” we become as negative thoughts associated with actual or feared loss become the inclination of the mind. At such times it becomes especially important to take time to cultivate a grounded connection to present-moment experience. It is this grounded connection, a felt sense of being, that is the antidote to the potentially incessant stream of negative ideation common during particularly challenging times. To the extent that we can remain rooted in present-moment experience, our thoughts will tend to dissipate and even dissolve, giving way to an inclination of the mind towards expansiveness and compassion, even during the most challenging life situations. As a holistic lawyer, I work with clients to help cultivate a more grounded and less reactive orientation towards challenging life situations. It is this grounding that gives rise to optimal solutions to conflict. 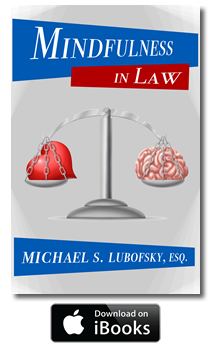 To learn more about holistic law, visit http://www.holistic-lawyer.com, or call Holistic Lawyer Michael Lubofsky at (415) 508-6263. Learning from Feedback: Perhaps the greatest value of mindfulness in the decision-making context is an improved ability to learn from experience. Because mindful individuals are less identified with conditioned thinking and thus more freed from egoic constraints, the are more likely to lear from their experience. In this way, they are less likely to repeat patterns that may have led to or exacerbated the situation at hand. Each of these abilities can be cultivated by my Holistic Law Counseling Program, a multi-session program that incorporates mindfulness exercises prior to arriving at a concrete legal strategy. For more information, visit http://www.holistic-lawyer.com, or call Holistic Attorney and Mediator Michael Lubofsky at (415) 508-6263.